Here at Watchisthis ?! we have the chance to see and try a lot of watches and what came to the HQ some days ago is really really nice. This piece is the new Boldr Expedition Fuji. 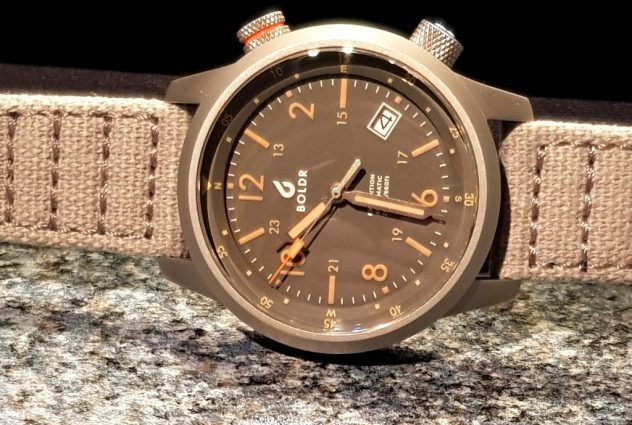 Boldr is a small watch brand from Singapore selling watches primarly through Kickstater. Once again they had a great success with the launch of their new models. For the record the campaign will end on the 9th of December 2017, so hurry up if you want to pre-order this pretty cool piece. 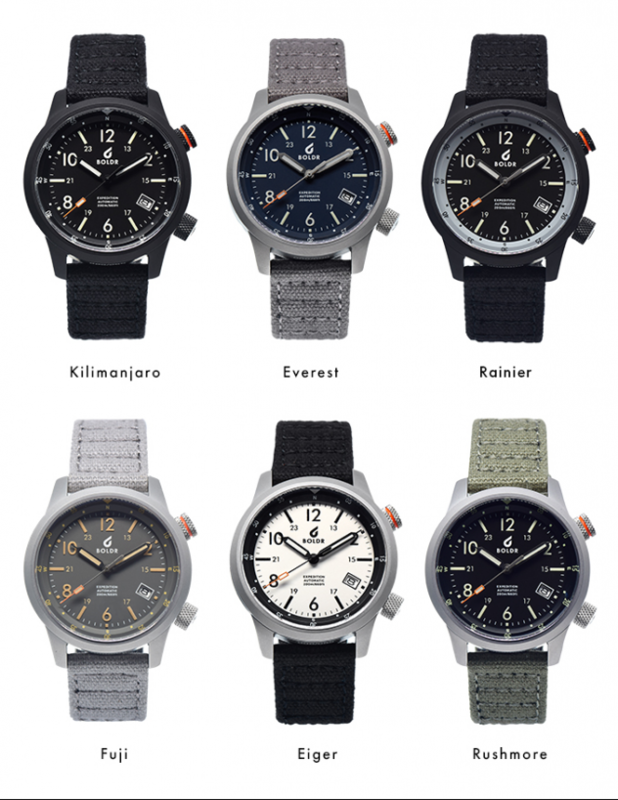 The new Expedition watch is available in 6 colours variations. We tested the Fuji… A grey-on-grey watch with beige indexes and numbers, and a touch of orange on the second hands and in the top crown at two which controls the internal bezel. The crown at 4 o’clock is used to adjust the time and the date. The dial is highly legible thanks to the large main numerals, large rectangles for the odd numbers, under whom we can see the 13 / 24 hour indexes printed in a smaller size. 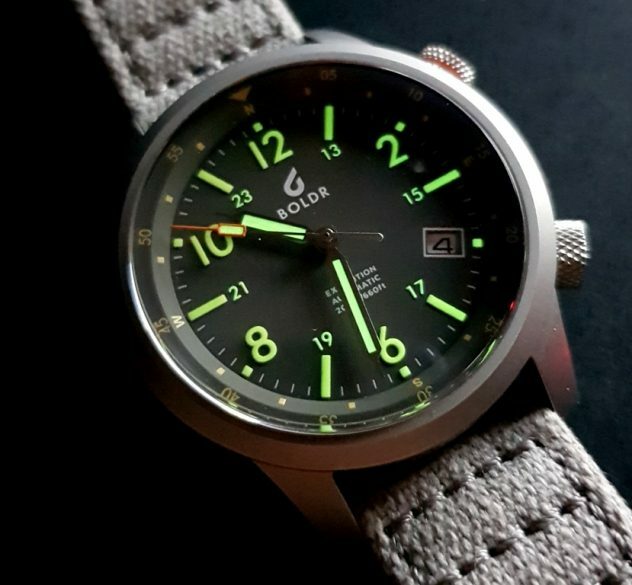 All these indications and even the hands are filled with green superluminova old radium lume, which is really cool when fully charged. The whole, with the printed logo at 12 and the date window at 4, is well balanced and I must say that I love the color combinantion with the grey, beige and orange. The internal bezel is nicely designed with a kind of dual-surface. Indeed, the bezel is flat on the top and then has a wide chamfer. On this one there’s is small numerals for the minutes and/or seconds. No need to talk about the compass index (N, E, S, W) because even if we see why they are their (adventure watch I mean) I don’t really see the usefulness. This internal bezel gives a lot of depth to the dial which is, I think, the coolest feature of the whole. 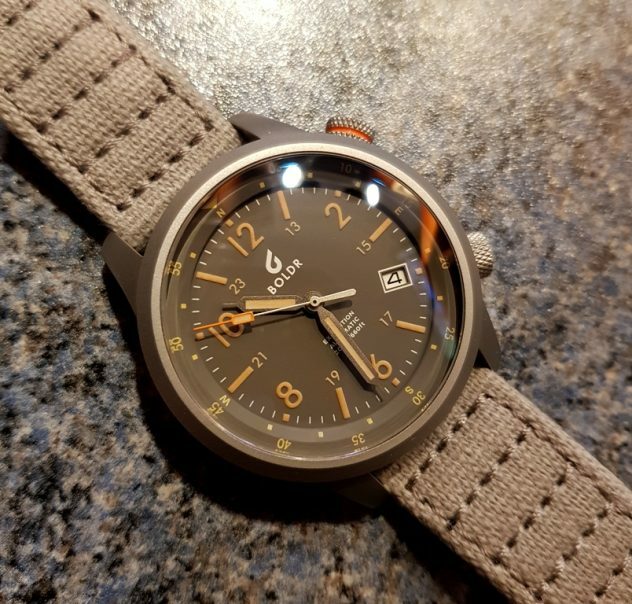 The stainless steel case with matte finish of this new timepiece measures 41 x 48 x 14.5mm, which is really comfortable and wearable for someone with a small wrist like me (mine measuring 17mm). It even looks smaller than what you can think thanks to the good proportion and also the curved lugs. A stylish watch with sapphire crystal on the front and the back. 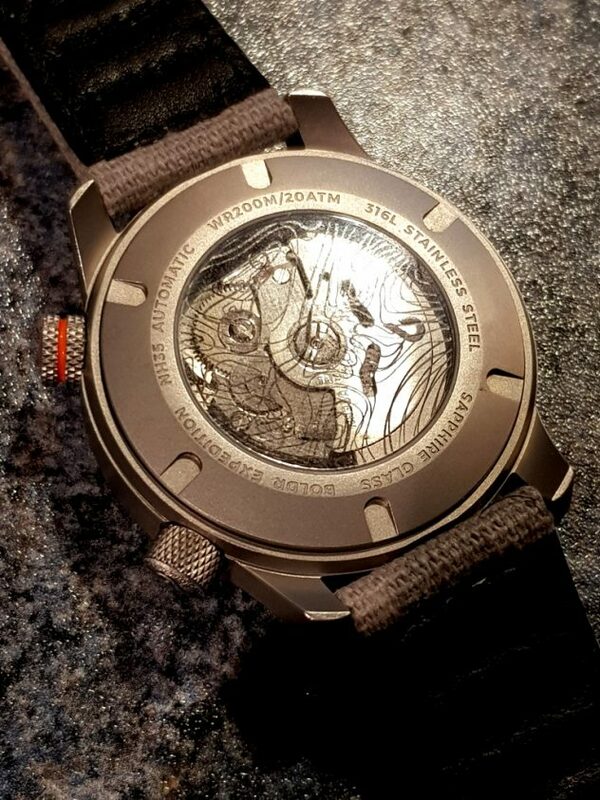 The latter shows the movement which is a Swiss Sellita SW200-1 automatic movement. Note that on the proto we get for the review the movement is a Seiko NH35, but the final production will have the Sellita. To finish there is a canvas strap which is really cool and soft for the wrist thanks to the leather part that you can find on the verso and it also features eyelets on the sizing hole that gives a nice and sporty style. The Expedition is a strong and sturdy adventure watch. Designed with modern-day adventurers and urban tactical wear in mind, it stands out in terms of style and strength – ready for anything you can throw at it. It’s perfectly suited your wrist, from your excursions in the field to your activities across the city. For me this piece hits all the right notes as everything just comes together in a beautiful way. The project is still live on Kickstarter for a few hours, so if you’re interested jump on it and pre-order yours. And for all the Boldr team, congrats on yet another campaign success!